I have never been to Hong Kong but it has always fascinated me as a potential photography destination. It is definitely on my photography “To Do” list. 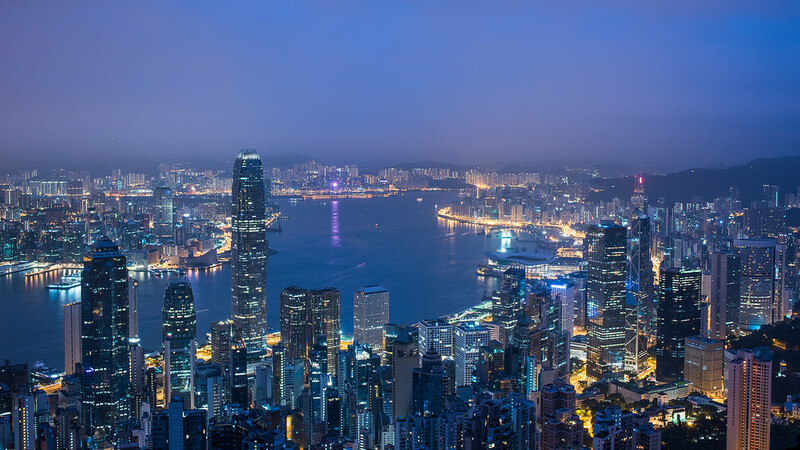 To better prepare for my first photography trip to Hong Kong, I asked Kevin Choi, a talented and young photographer from Hong Kong, to share his favorite Hong Kong photography spots throughout the city. Hong Kong is famous for its vibrant business culture but, it’s also a great place for photography. In fact, while the cityscape is truly stunning, Hong Kong also offers a variety of awesome landscapes just waiting to be captured. There are many spots throughout the bustling city that allow you to easily capture stunning images. However, many of them are seasonal locations. Being a native, I can’t wait to share with you my eight favorite photography locations throughout the city as well as the best time to capture truly remarkable photos. 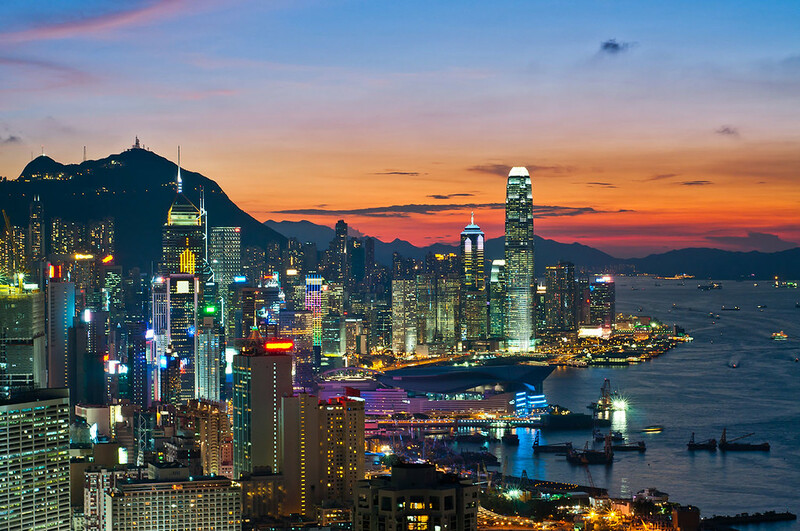 The Peak, also known as Victoria Peak, is the highest hill in Hong Kong Island. 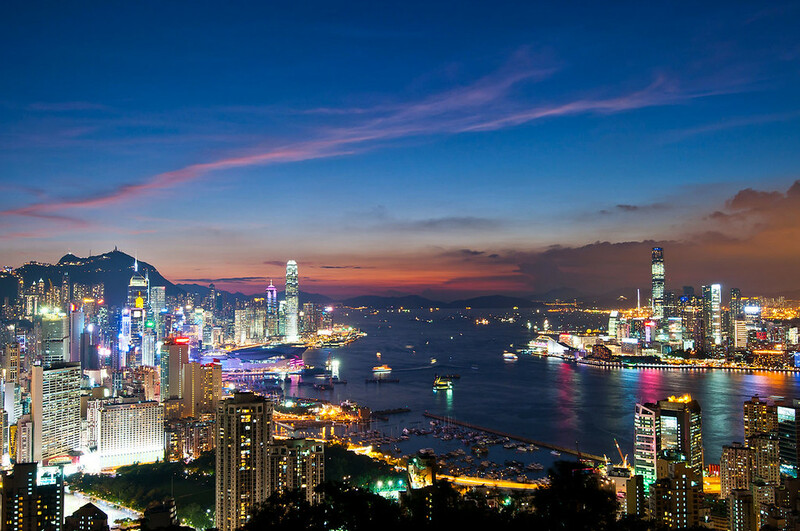 It’s an iconic attraction and a photographer’s dream because you can capture the full view of Victoria Harbour. Even though there is a viewing platform at The Peak, most local photographers choose a different route to avoid tourists and the expensive entry fee. More importantly, the view from the platform is blocked by a mountain. If you’re looking to capture the best vantage point, I suggest taking a 15 to 20 minute walk down Lugard Road. There, you’ll find a few spots without anything blocking the breathtaking view! 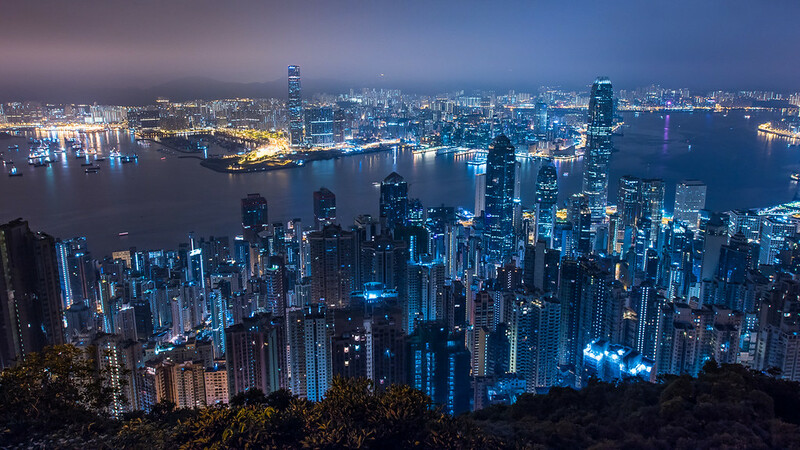 Visiting The Peak at night is incredibly popular because there’s so much to see from Lugard Road. Sunrises are stunning especially in the summer since winters are usually harsh in Hong Kong, not to mention the sun is usually blocked behind the mountain in the early morning hours. Without a doubt, the best season to capture The Peak in its true beauty is during the summer from Lugard Road. In Hong Kong, there are two interesting transportation options—the double deck tram and the double deck bus. 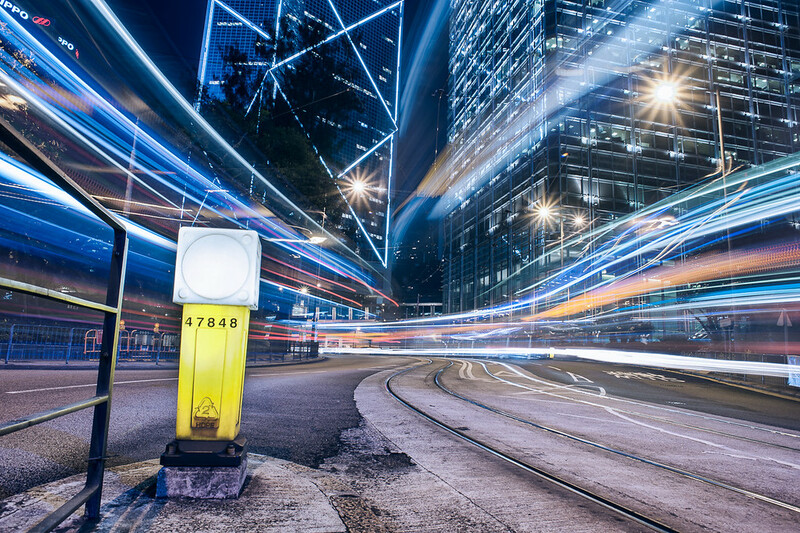 After the sun goes down, every vehicle in the city has to turn on their head lights, which gives photographers an opportunity to capture a variety of interesting light trails in the busy city. In the Central Business District (CBD) of Hong Kong, traffic is nonstop. Moreover, after sunset, all of the skyscrapers in the city light up and create a majestic background that you won’t find anywhere else. From Central to Admiralty, there are a lot of different spots just waiting to be photographed. I suggest using a wide angle lens to magnify the effect of the light trail and ensure you capture it in all of its glory. Also, instead of shooting late at night, shooting in the blue hour will give you a nice blue tone in the sky. 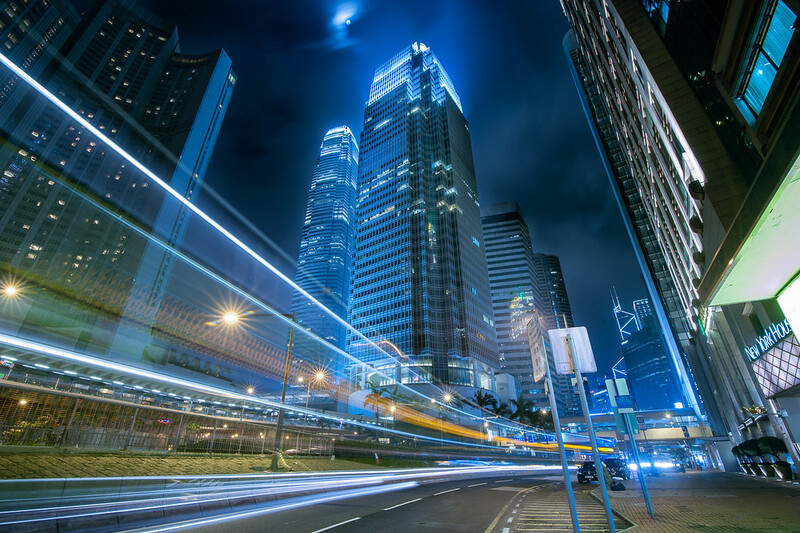 The best time to shoot the cityscape’s light trail is during the blue hour each day. Located south of North Point, the Braemar Hill district is full of expensive housing. Photographers love this area because, at the top of Braemar Hill, you can capture the panorama of Victoria Harbour at a unique angle. If Lugard Road offers the perfect view of sunrise at The Peak, then Braemar Hill just might offer the perfect view of sunset in Hong Kong. Like The Peak, winter is not an ideal time to photograph this location because smog often decreases the clarity of the view and, in extreme conditions, sometimes you can’t even can’t see the IFC building. In all honesty, Braemar’s lookout is not an easy place to reach as it requires a 20 to 30 minute hike to the top. The problem is that there is no actual “road,” which means the hike to the top is like walking through the jungle. Luckily, this is a famous location and many local photographers brave the overgrown jungle hike to shoot together. In fact, most of them are polite and kind enough to bring you there if you ask. Just watch out for spider wraps and honeycombs, and be sure to follow the reflective ribbon on the trees as a guide. The best season to photograph Braemar Hill is summer at sunset. Tai Mo Shan, which literally means big hat mountain, is the highest mountain in Hong Kong. Looking down from 957m, you can see how close the country park and city are from above. This is the uniqueness of Hong Kong. As the city’s highest point, it’s no surprise that Tai Mo Shan is perfect for both sunrises and sunsets. If you’re lucky, you may also see the rare sea cloud in the spring. Sometimes, after heavy spring rains, a cloud will form around the mountain allowing you to capture some of the very unique images from Hong Kong’s highest point. Getting to the top of Tai Mo Shan peak is certainly no task for the weary. You can take a taxi or drive yourself to the peak where a 30 minute hike will take you straight to the top. But, remember that not every taxi driver is willing to drop you off at the peak. You may need to try a few taxis or ask in advance to find a driver willing to give you a ride. 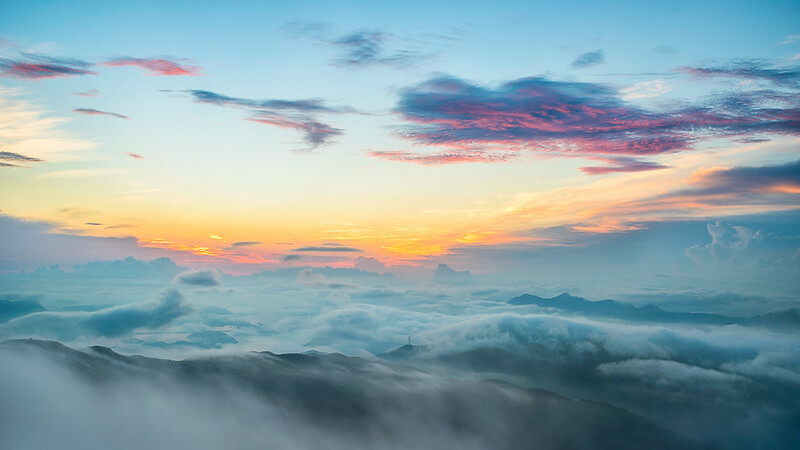 The best season to photograph Tai Mo Shan is summer during sunrise and sunset. If you want to try your luck capturing the sea cloud, be sure to visit in the spring. Shek O is a beach in southern Hong Kong Island that just so happens to be a famous spot for pre-wedding photography. At the back of the Shek O village, there is a beautiful blue bridge connecting Tai Tau Chau, which literally means big head island. This is the perfect location to capture a seascape sunrise and a long exposure seascape since the long exposure of the rocky coastline produces dreamy images. To learn more about long exposure, be sure to visit my blog. 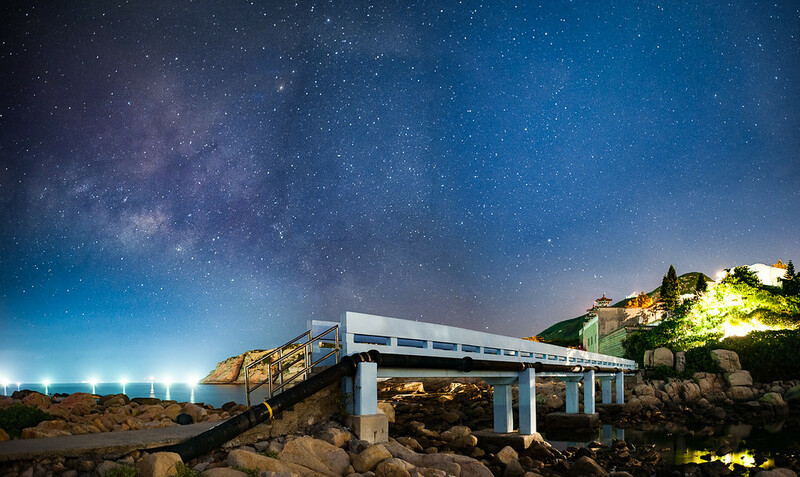 Shek O is also a great place to shoot the summer milky way. Although it is close to the city, the light pollution is blocked by the neighboring hill. Also, the location faces southeast, which is where the milky way rises. 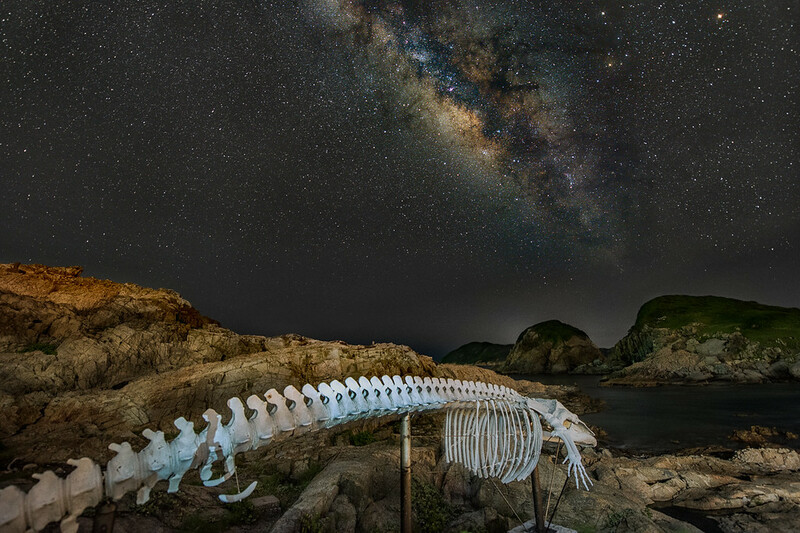 However, during late summer, there are a lot of squid boats on the sea and, because of their strong lighting to attract squid, they can also affect any attempt to photograph the milky way. Another unique phenomenon at Shek O is the algae bloom. In spring, the algae bloom is not an uncommon occurrence in Hong Kong. 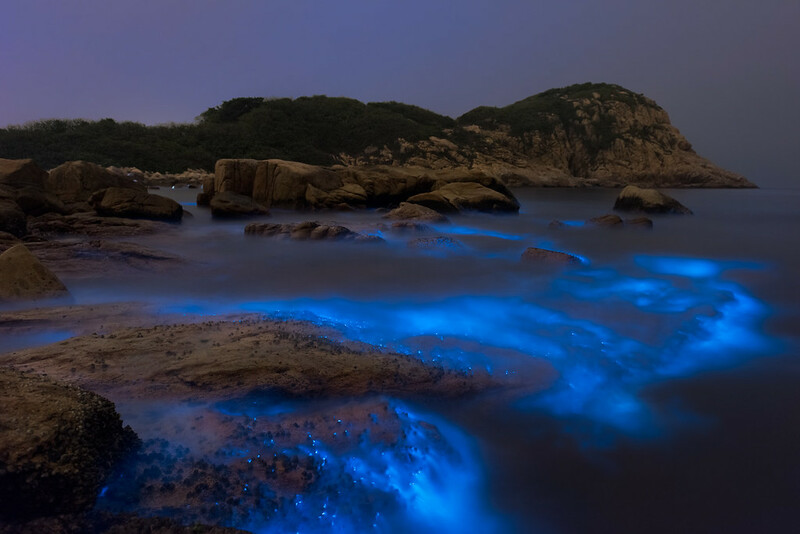 During the bloom, a special type of algae emits blue light, which is also known as blue tears. Although the algae bloom is not necessarily healthy for the environment, it definitely gives photographers the chance to take breathtaking and dreamy images. 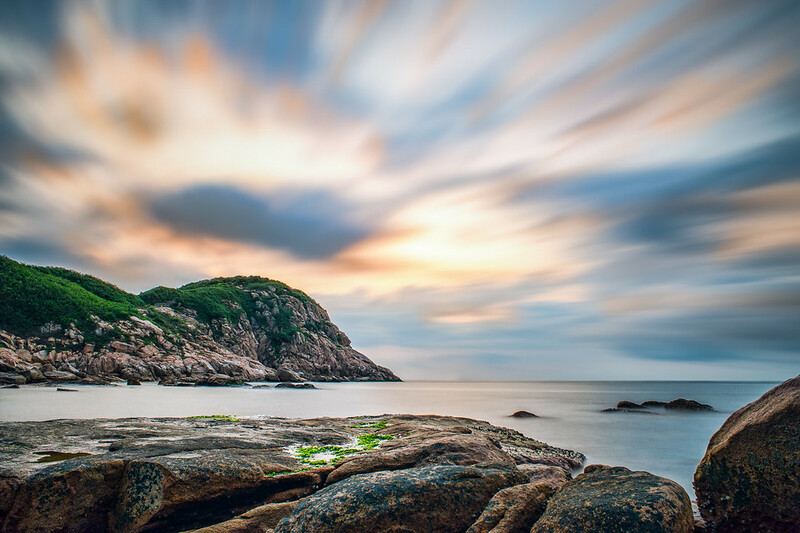 The best time to photograph Shek O is from spring to summer. Literally translated as moth hill, Fei Ngo Shan is also called Kowloon Peak. Excluding Lantau Island, this is the second highest peak in Hong Kong and is located in the northeast corner of Kowloon. From the top of Fei Ngo Shan, you can see a bird’s eye view of the densest residential area of Kowloon. In spring or after heavy rain in the summer, cloud formations commonly known as sea clouds often surround the mountain. 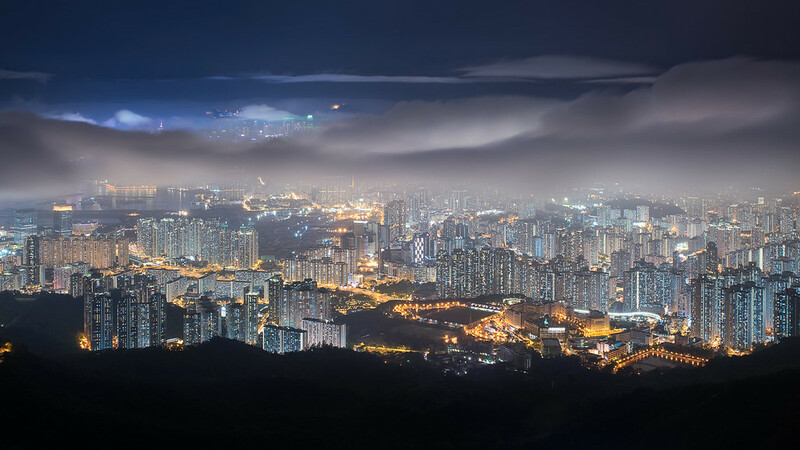 With its height stretching to 602m, you might be incredibly lucky to observe a sea cloud at night when the cloud covers Kowloon and the lights from the different buildings illuminate the cloud for an awesome view. Fei Ngo Shan is not a difficult location to reach because you can take a taxi to the peak and can shoot next to the road. However, because the peak faces south, it’s impossible to shoot sunrises or sunsets from here. 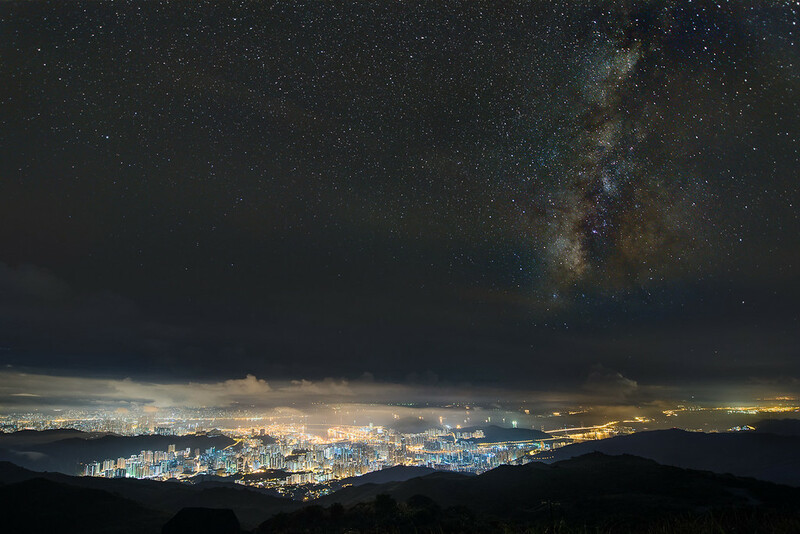 The best time to shoot in Fei Ngo Shan is during the blue hour of spring and summer. 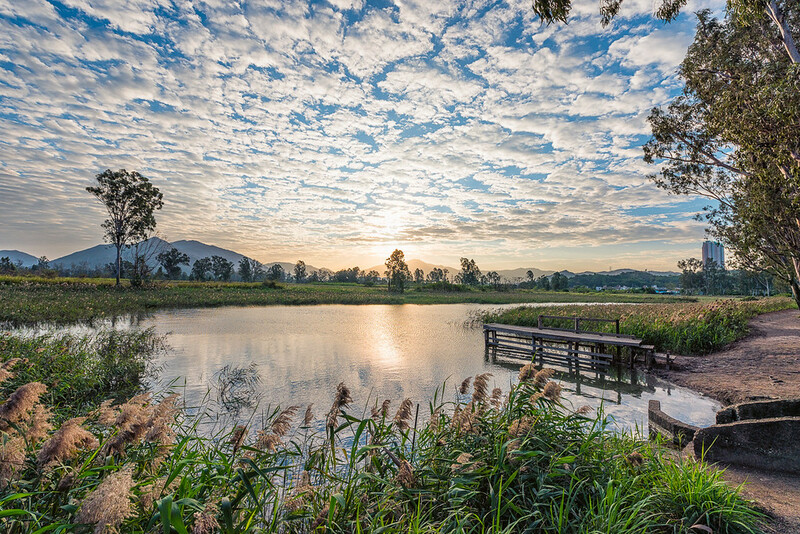 In the northwest of the New Territory, there is a place called Yuen Long that is home to two of Hong Kong’s most important pieces of wetlands—Mai Po and Nam Sang Wai. The wetlands attract hundreds to thousands of postseason birds to Hong Kong, including endangered species like the black-faced spoonbill. However, Mai Po is a restricted area that requires a permit. Nam Sang Wai, on the other hand, is open to the public. A famous location for bird photography, Nam Sang Wai is also famous for its gorgeous sunrises since its lack of skyscrapers and shopping malls shows another, more natural side of Hong Kong. A perfect and convenient place to get some fresh air and get back in touch with nature, you can drive, take a taxi, or even ride a bicycle to Nam Sang Wai. 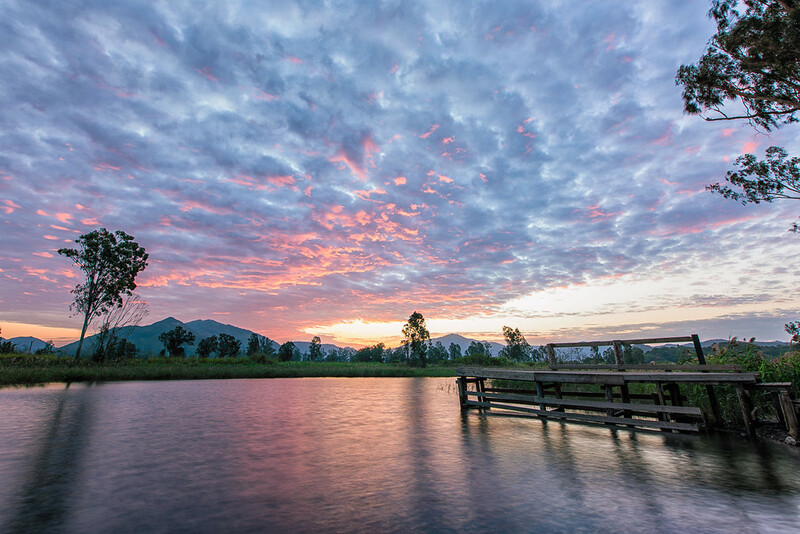 The best time for shooting in Nam Sang Wai is summer at sunrise. If you’re interested in astrology, you can’t miss D’Aguilar or Hok Tsui. Located in the southeastern most portion of Hong Kong Island, D’Aguilar is a marine protected area and is home to The University of Hong Kong’s research centre. Because of its special location, there is very little light pollution, which means that shooting the milky way is no difficult task. However, after the fishing moratorium is over, fishing boats begin to light up the sea and create a high volume of light pollution that can affect the clarity needed when photographing the Milky Way. 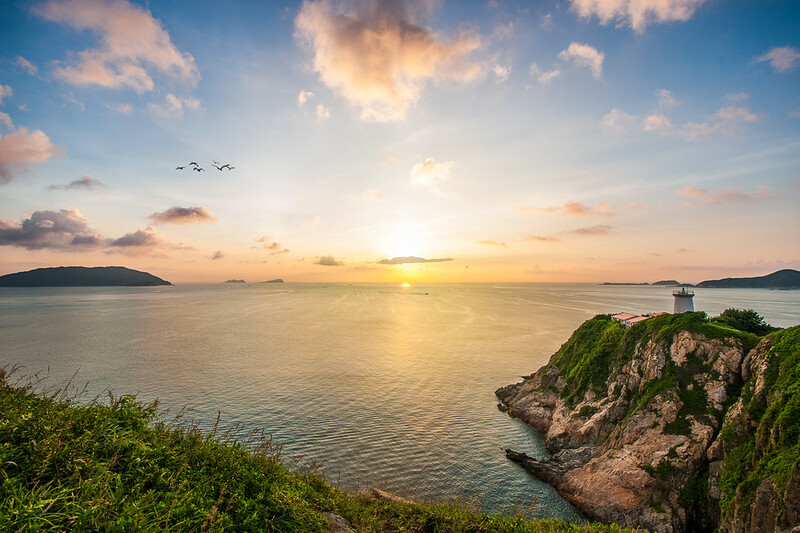 Aside from astrophotography, sunrises and seascapes are also ideal at D’Aguilar because, much like Shek O, D’Aguilar faces southeast. And, as all local photographers know, a sunrise with a burning summer sky in Hong Kong is one of the most exquisite images to add to one’s portfolio. Transportation becomes a problem when leaving D’Aguilar because, as a protected area, only taxis are allowed. If you’re wanting to take a series of high quality milky way shots and have plenty of time, I suggest booking a taxi at least 30 minutes before you’re ready to leave. The best time to shoot in D’Aguilar is on a clear night in the spring until the end of the fishing moratorium, which is normally July 31st. There are dozens more places to photograph in Hong Kong, but these eight locations are definitely my favorites Hong Kong photography spots. One thing I have to point out is a common trait that each location shares—almost all of them are ideal in late spring and summer. Because the winter monsoon brings tons of suspended particles from mainland China, Hong Kong experiences terribly smoggy weather where air pollutants drastically decrease visibility. Therefore, it’s safe to say that in order to get some awesome photographs throughout Hong Kong, schedule your trip for the late spring and summer! Kevin Choi is a freelance photographer who has a love for landscape and wildlife, the founder of CaptureTheMoment, and has been carrying Nikon with him since 2008. He never stops dreaming, as you would too. Thanks so much for your insights, Kevin. It looks like I’ll be coming to Hong Kong sometime between May and July for a photo shoot (I am a golf course photographer), and your thoughts on the best times of year to shoot are very helpful. Also, your location advice is very much appreciated. I will probably add a few days after my scheduled shoot to roam Hong Kong looking for landscape shooting opportunities (when I’m not shooting golf courses, I’m looking for landscapes!) so your tips are great. Thanks! Thank you for your support! Hope that you can have chance to get some good landscape photos when you visit HK.